(CNN) - Secretary of Education Betsy DeVos was hit with another lawsuit Tuesday claiming she failed to cancel student debt owed by people whose for-profit colleges have been shut down. The new lawsuit comes a month after a federal judge ruled that the regulation should immediately go into effect, after more than a year of what he called "arbitrary and capricious" delays by DeVos. "Under current leadership, the Department of Education seems determined to deny student borrowers the financial relief to which they are entitled," said Aaron Ament, the president of the National Student Legal Defense Network, which is helping represent the plaintiff. "The students we are trying to help have been doubly victimized — first by the for-profit colleges that deceived them, and now by the federal government that refuses to help," Ament said in a statement. Liz Hill, a spokesperson for DeVos, did not immediately respond to a request for comment. 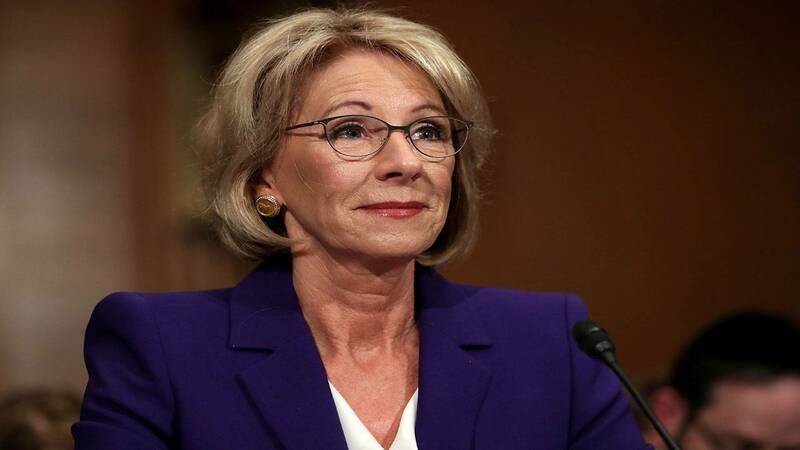 She recently told the New York Times that the department would carry out the loan relief rule "soon," but noted that DeVos considers it "bad policy." The rule, known as Borrower Defense, made loan discharge automatic for some students who could not complete their educations because their schools shut down while they were enrolled. It also makes it easier for students to apply for relief if they believe their schools misled them, including by inflating job placement rates. DeVos delayed the rule from going into effect and is continuing to work on a rewrite. The number of students applying for debt relief soared as the Obama administration cracked down on for-profit colleges. Corinthian Colleges folded in 2015 after it was fined $30 million by the government for misleading prospective students with inflated job placement numbers and ITT Tech collapsed a year later after the government cut off federal financial aid over irregularities. Former Corinthian and ITT Tech students are unlikely to get immediate debt relief because they must wait three years to be eligible. But there are roughly 1,400 other school campuses that closed between 2013 and 2015 whose students could be eligible immediately, according to the complaint. There are currently 106,000 people waiting for government approval for debt relief. DeVos was first sued last year for delaying the Borrower Defense rule by 18 states and Washington DC. Massachusetts Attorney General Maura Healey, who led the coalition, has attacked DeVos for siding with the for-profit college industry over students. "Since Day One, Secretary DeVos has sided with for-profit school executives against students and families drowning in unaffordable student loans," Healey said in a statement at the time she filed the lawsuit. DeVos has been widely criticized by consumer advocacy groups for hiring department officials with ties to the industry. She plans to repeal another rule, known as Gainful Employment, that was important to the Obama administration's efforts to regulate for-profit schools. Earlier this year, DeVos proposed creating a new formula for granting partial loan forgiveness to students who were defrauded by their schools. Instead of wiping away a borrower's total student debt, it would cancel a portion of it, based on the income of students who graduated from similar programs. The plan would save the government $12.7 billion over a 10-year period compared with the Obama version. But a judge has ruled that this new formula violated the privacy rights of students.